The ezFrame Wall Mount HDTV Fixed Frame Projection Screen features a 48.8 x 87.0" viewing area, CineGrey 5D finish with a 1.5 gain rating and 80° (40° L/R) viewing angle. The anodized aluminum frame and border are covered with black velour to help absorb any excess projector throw, and reject any ambient light. 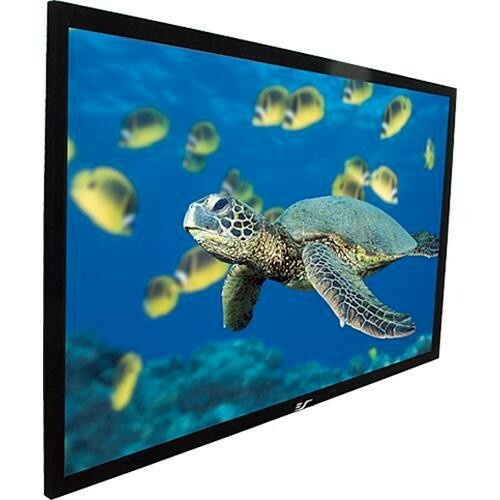 The screen is easy to assemble and includes sliding wall mounts to ensure proper alignment. There is also a center support bar that is inserted vertically behind the frame to keep it both taught and plumb. The CineGrey 5D screen finish is designed for 2D as well as active and passive 3D stereoscopic presentations. It is a tensioned, flame and mildew-resistant surface characterized by a sharp, clear image and 88% polarization retention. Its angular reflective and ambient light rejecting capabilities deliver a bright image with accurate contrast in venues where ambient light is hard to control. It can be cleaned with mild soap and water. Box Dimensions (LxWxH) 58.0 x 12.0 x 4.0"
ezFrame Wall Mount HDTV Fixed Frame Projection Screen (48.8 x 87.0") is rated 5.0 out of 5 by 1. Rated 5 out of 5 by Milcher from Fantastic! Easy to install, and provides an excellent quality picture!